WIN A TRIP TO SOUTH AFRICA! WIN A TRIP TO BEAUTIFUL SOUTH AFRICA! Watch The Space Between for a chance to win this amazing trip on South African Airways. One contest entry available with your playbill at the theatre. Book your tickets now! The Space Between is Co-presented by North York Arts and opens February 25, 2016 at Aki Studio – Daniels Spectrum and runs till March 6, 2016. 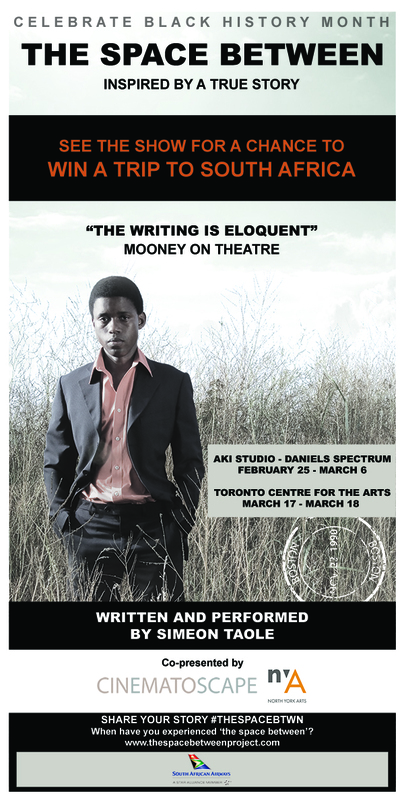 An encore presentation will run at Toronto Centre for the Arts on March 17 and 18, 2016. Tickets for The Space Between at AKI STUDIO – DANIELS SPECTRUM are now available online here. Tickets for The Space Between at TORONTO CENTRE FOR THE ARTS are now available online here. Cinematoscape is a multi-disciplinary arts company based in Toronto. We believe in the power of stories to illuminate, inspire, educate, and engage through an immersive 'cinematic escape'.